Vision and eye health are so important and help kids be successful in school, sports, and other activities! Today I am excited to partner with the American Optometric Association (AOA) and share 5 simple activities to strengthen eye health and visual skills! We'll also be chatting about our recent trip to our doctor of Optometry (O.D.) and why YOU should add an in-person comprehensive eye exam to your Back to School checklist! Did you know that according to the American Optometric Association’s 2015 Eye-Q Survey®, 89 percent of those surveyed believe vision screenings (like those offered at school and pediatric offices) are an effective way to detect vision problems? 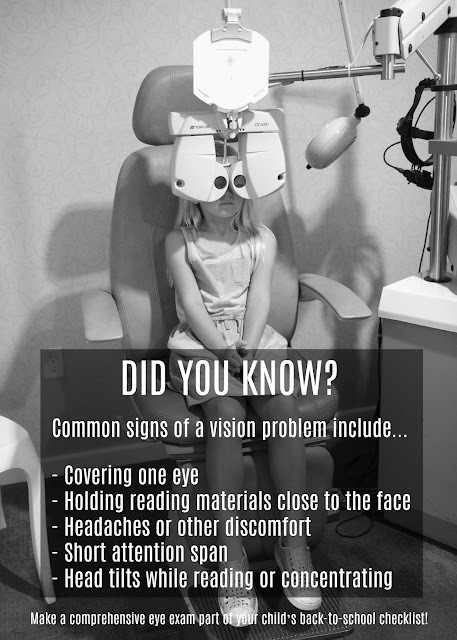 In fact, vision screenings can miss as many as 60% of children with vision problems. A comprehensive eye exam is actually the ONLY way to rule out all vision problems. 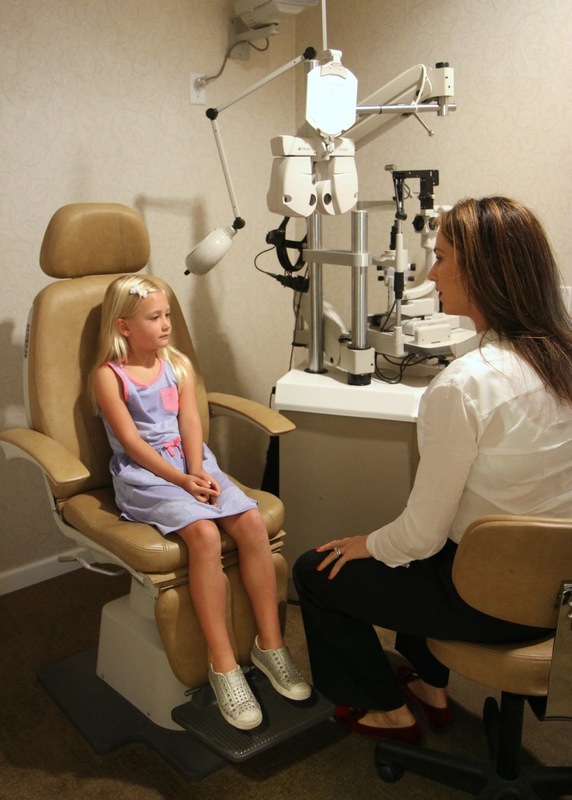 This is why the AOA’s new guideline, Evidence-Based Clinical Practice Guideline: Comprehensive Pediatric Eye and Vision Examination, now recommends children ages six to 18 years should receive a regular, in-person, comprehensive eye exam before entering the first grade and annually thereafter. As an elementary school teacher, I often found my student's vision changed throughout their early years. Sometimes I had students covering one eye to see things, having an increasingly short attention span, holding reading materials close to their face, and tilting their head while reading or concentrating. Often after a recommendation to see an optometrist, we discovered that some students actually had vision problems that were impacting their ability to concentrate and be successful in school. 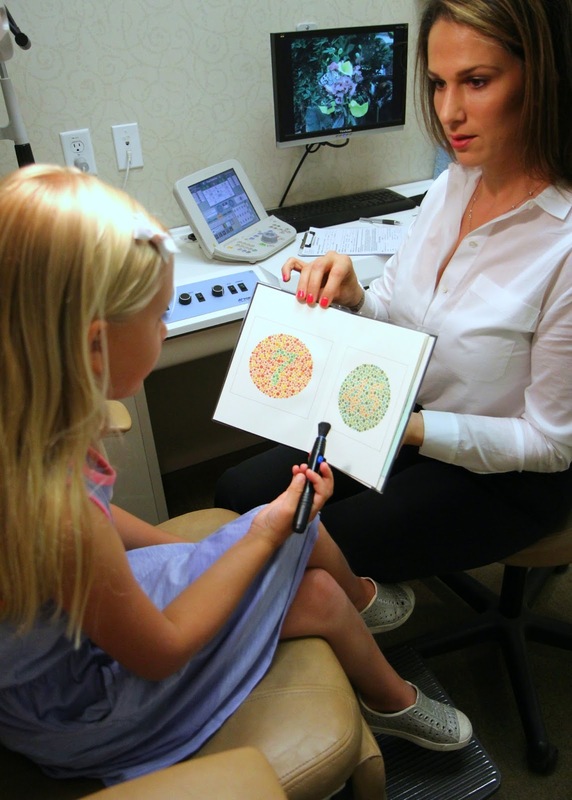 I am now a HUGE advocate for annual comprehensive eye exams for kids and I think it is so important to alert parents to symptoms of potential vision/eye health problems. Early diagnosis and treatment of eye and vision problems can help prevent vision loss and help children reach their full potential. To find a doctor of optometry near you and to learn more, visit the American Optometric Association’s doctor locator at www.aoa.org. 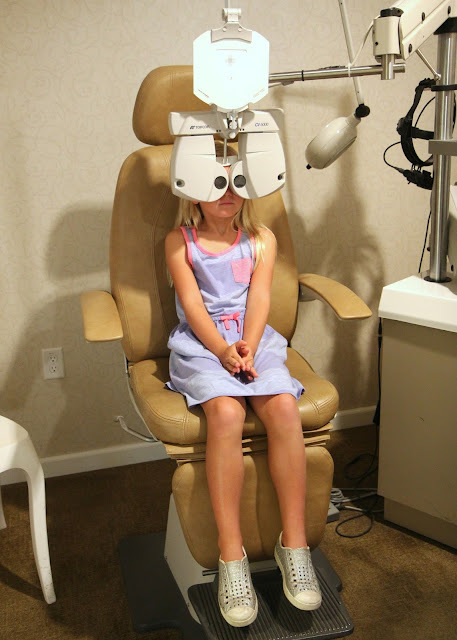 We recently went to Visual Expressions Optometry to visit the optometrist for a comprehensive eye exam! My oldest two kids were so excited to learn more about their eyes and see the cool machines that my husband told them all about. We left the younger two at home because 4 kids is sometimes too much for me to handle when we are doing appointments. We met AOA member Dr. Selin Khayatan and the kids had fun chatting with her and getting to know her a little bit. 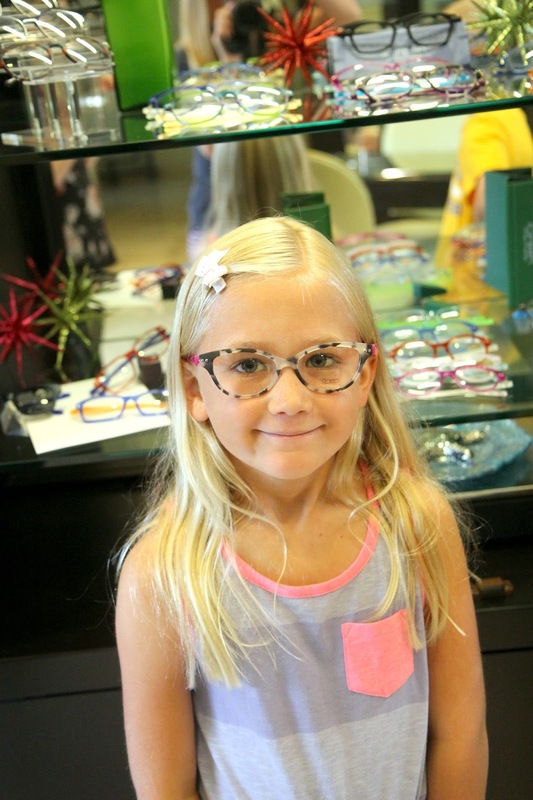 While we waited for our appointment the kids had a great time checking out all of the frames in the store and trying them on. It was adorable to see them deciding on their favorites. The office staff was so friendly and helpful. 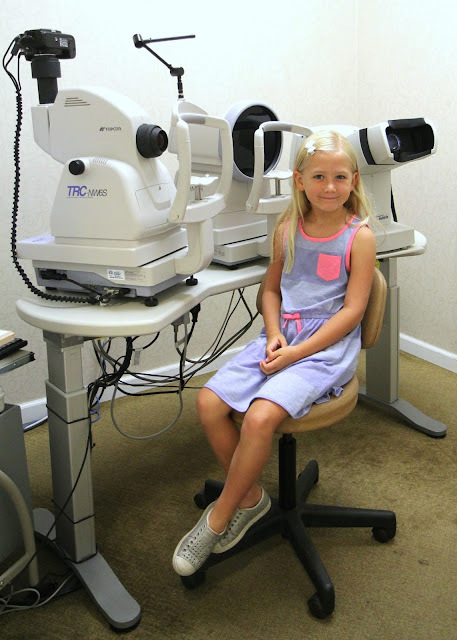 Since the kids had never had a comprehensive eye exam before, the staff explained clearly what each machine did and then we got to work testing and trying out all of the machines. Typically, an exam by an optometrist includes twelve steps to assess the health of the eyes and vision. An exam goes beyond just checking for vision issues, but checks for complete eye health! You can read more details about what goes into an exam HERE. At the end of our appointment the kids got to choose prizes from the treasure box. 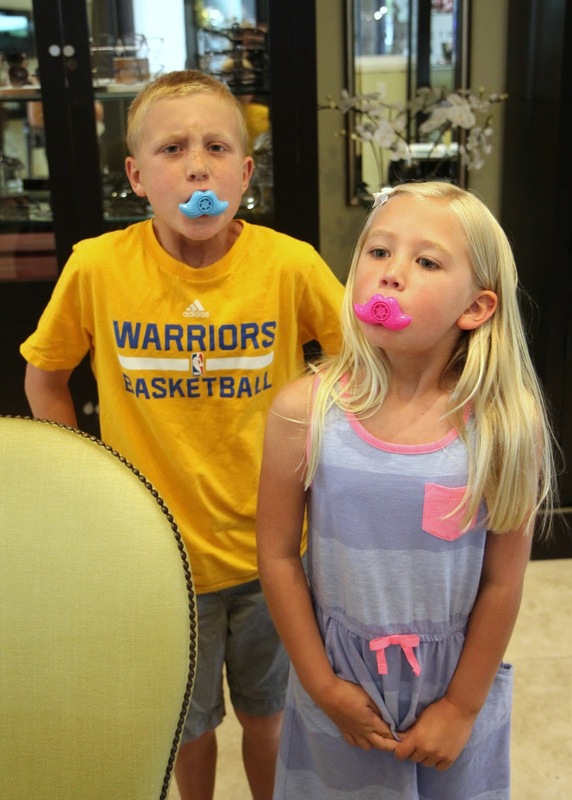 They chose these mouth whistles and then they blew them the whole way home! LOL! I really enjoyed the opportunity to talk with Dr. Khayatan about simple things like screen time and how it effects vision, the negative effects that could happen when my kids sneak and read in the dark, how to better protect eyes on bright days, and how vision problems can influence reading fluency. An annual comprehensive eye exam needs to get on your schedule ASAP! It can help prepare your child for success in school and other extra-curricular activities. Skills needed for sport activities include clear distance vision, good depth perception, wide field of vision and effective hand-eye coordination. 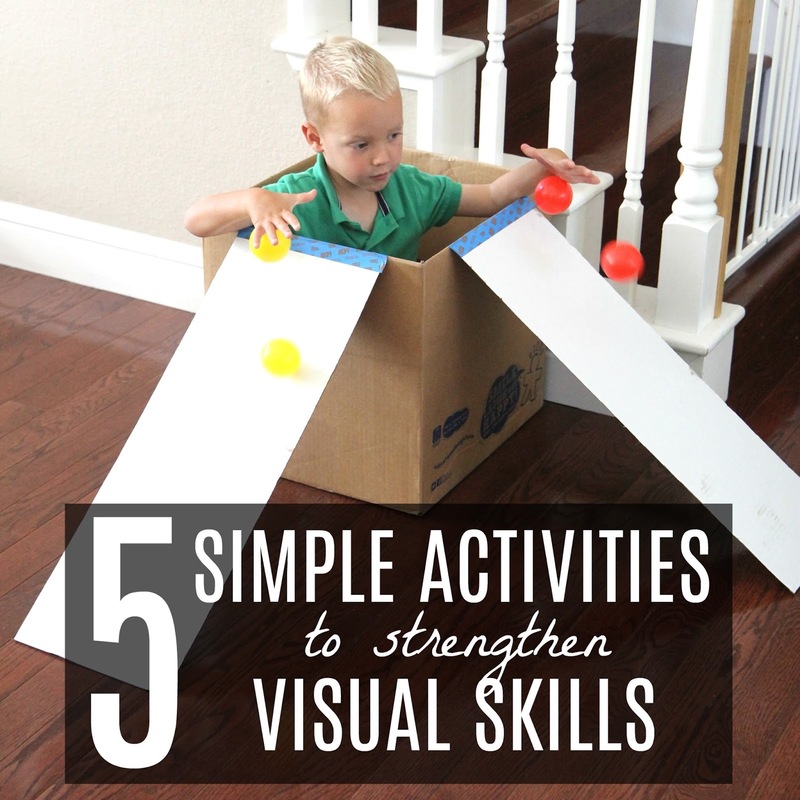 These five simple activities, inspired by the AOA’s tips on how parents can help with visual development, that I am sharing can help kids strengthen their visual skills and eye health! Taking time during these early years to help make sure vision is developing normally can provide a child with a good start for school. Assembling puzzles are great ways to strengthen hand-eye coordination. For this activity we just cut out simple pictures from magazines, glued them onto paper plates, and then cut them up into simple puzzles. The kids had fun putting these together! For this activity just grab a big box and some pieces of cardboard and make a ramp or two. Add in plastic balls and you are ready to play! Rolling activities and tracking the colorful balls as you push them can help kids develop their visual skills. They can also sharpen your child's general eye movement skills. Cutting with scissors involves a lot of skill! While you cut, you are working on visual perception (seeing what you are cutting), visual motor integration (eye-hand coordination), and fine motor skills (strengthening your finger muscles). Our snipping tray this week just included straws and cupcake tin liners. These were fun to snip while chatting. 4. HEAD TO THE PARK! Playing at the park (or even just in your backyard) and climbing and swinging is an awesome way to work on eye-hand-body coordination! These skills are essential as kids prepare for school. Stacking building blocks can help improve visual skills. 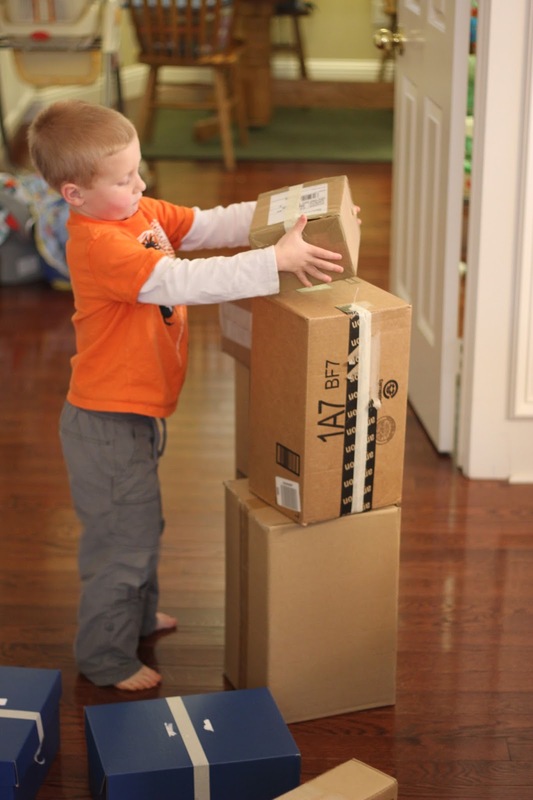 We love to collect Amazon boxes and other large package boxes and then make giant towers. The ones that are taller than me are my favorite! I love knowing that there are things I can be doing at home to help strengthen my kid's visual skills and eye health! I also love that I can take my kids to an annual comprehensive eye exam and quickly know about any eye health or vision problems! If you have any other ideas you've tried that can help strengthen eye health, please pass them along!! You can learn more about the importance of children’s comprehensive exams here. Also, if you've had a great eye exam experience with your kids, share about it!